In 2007, Michael Denney launched a little Web hosting company called MDDHosting. The private, “boutique” host boasts claims of speed and service, which has been the skeleton on which the company was built and grows. They have their headquarters in Indiana, where they were started, and also have a data center in Denver. What I like is that MDDHosting isn’t trying to re-invent the wheel. They’re taking the wheel and making it better, and, in their words, more affordable. Their Web site is clear and easy-to-understand, and they don’t hide behind wordy Terms of Service. 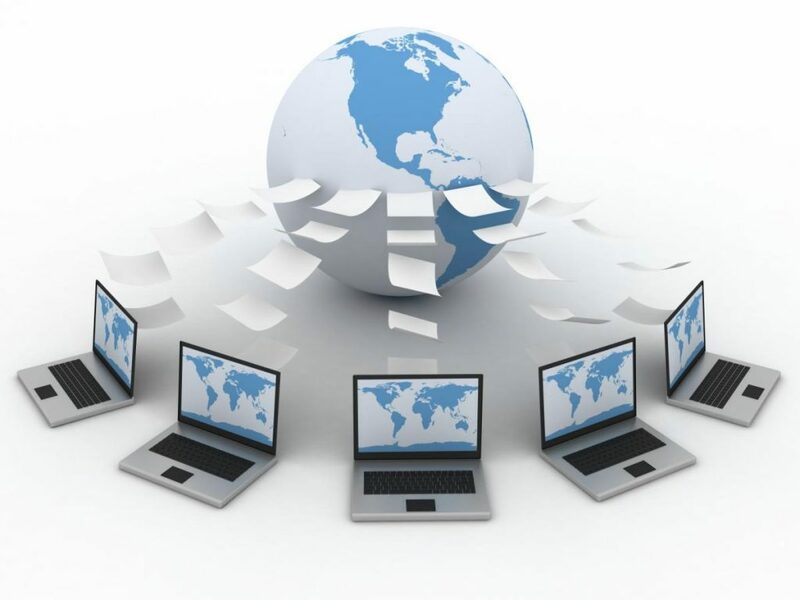 MDDHosting offers two shared hosting plans. Both offer unlimited data transfer, unlimited e-mail accounts, unlimited databases, cPanel for the control panel, and free SSL with Let’s Encrypt. When they say unlimited, they provide enough CPU, RAM, and Disk I/O to support Web sites with up to 350,000 visitors each month. 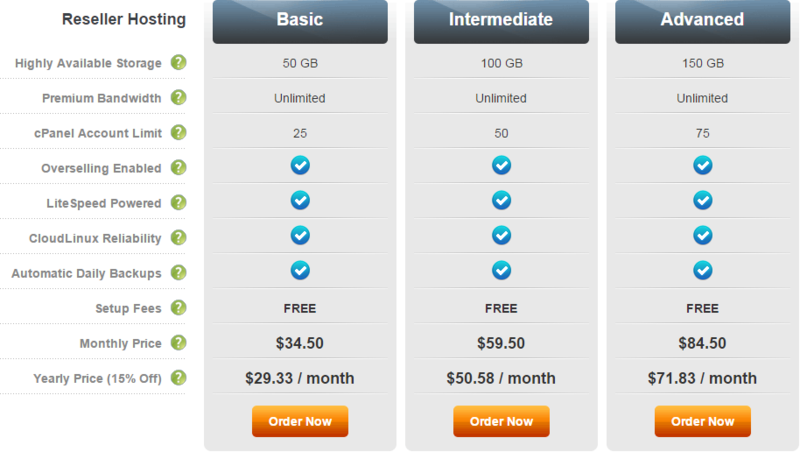 The basic plan is $3.50 each month and includes 1 GB of disk space space for one domain. They designed this plan with new Web managers and in mind. The professional plan is $9.50 each month, and gives you unlimited disk space for unlimited domains. This is ideal for customers who have many already established site. unlimited domains, subdomains, and MySQL databases. Each plan has unlimited e-mail accounts, including auto-responders and forwarders, as well as POP3, IMAP and SMTP access. The plans have cPanel, Softaculous, SSH access, plenty of compatibilities, and automatic daily backups. You get instant set-up and free transfer, if they are able. Basic: You get 5 GB of RAID10 SSD storage and 300 GB of guaranteed bandwidth for $21.25 each month with an annual plan that gives you a 15 percent discount. Monthly plans are available for a higher cost, for all three options. Intermediate: You’ll get 10 GB of RAID10 SSD storage and 600 GB of guaranteed bandwidth for $42.50 each month with the 15 percent discount. Advanced: You’ll get 15 GB of RAID10 SSD storage and 900 GB of guaranteed bandwidth for $63.75 per month, again, with the 15 percent discount. Resellers also have plenty of features, with many of the same benefits as their premium plans, free set-up, unlimited e-mail accounts, private nameservers, daily backups, CloudLinux reliability, overselling and unlimited premium bandwidth. The basic plan gives you 50 GB of highly available storage and a cPanel limit of 25 accounts for $34.50 each month; sign up for a year and you’ll pay $29.33 each month. 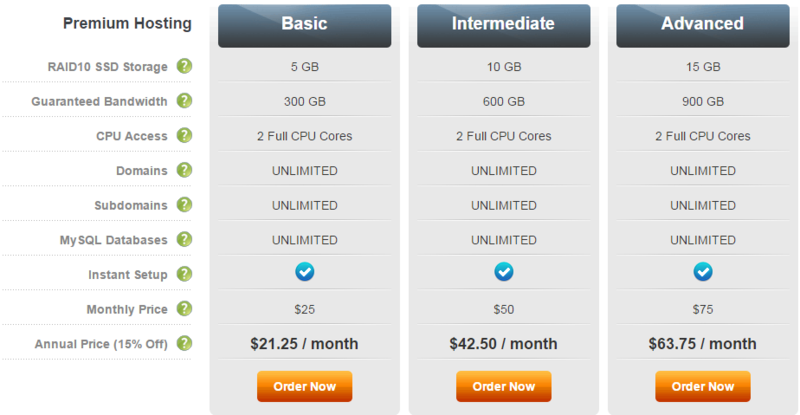 The intermediate plan offers 100 GB of highly available storage and a limit of 50 accounts on cPanel. The monthly contract price is $59.50; if you get a contract for a year, you’ll pay $50.58 each month. The advanced plan has 150 GB of highly available space with limit of 75 accounts, for $84.50 on month-to-month accounts, and $71.83 each month on a yearly contract. Virtual private servers, just like the rest of MDDHosting’s servers, are Dual XEON Quad Core processors with 8 cores and at least 12 GB of RAM. Each VPS account runs CentOS 6, cPanel, SolusVM for the VPS control panel, and OpenVZ6 for visualization. More importantly, you get full root access, instant reboots and automatic daily backups. All accounts have a 1,000 MBPS network port speed, two IP addresses, and 2GB VSwap. The accounts are automatically provisioned. Some of the features that are supported in shared hosting, like LiteSpeed, WHMCS billing,softaculous, and additional IP addresses have an additional cost that ranges from an extra $2 per month to an additional $10 per month, depending on the service. VZ 2G: You get 2 CPU cores with 2GB of dedicated RAM, 1 TB of data transfer, and 100 GB of storage for a monthly payment of $74.96 per month or $71.21 per month with an annual contract. VZ 4G: The plan offers 4 CPU cores with 4 GB of dedicated RAM, 200 GB of storage and 3 TB of data transfer. Monthly costs for a month-to-month contract are $134.96; for an annual contract, you’ll pay $128.21 per month. VZ 6G: You’ll get 6 CPU cores, with 5TB of data transfer and 300 GB of storage.This plan costs $187.46 per month on a month-to-month contract, and $179.96 per month for an annual contract. MDDHosting is just on the border, with a 99.9 percent average uptime — something they promise. Keeping your site up and running means that your site is available to customers at any time; downtime can hurt your company. Industry standard is 99.9 percent uptime, which means that your site is only down for about 43 minutes each month. While MDDHosting fluctuates to give you a solid 99.9 percent average, they offer a 99.9 percent uptime guarantee for shared and reseller accounts. Send an e-mail within seven days if you experience downtime above the 99.9 percent uptime, and if they agree, you’ll get a one month credit to your account. MDDHosting comes in nearly 50 percent faster than industry average, with a blazing page load speed. They offer LiteSpeed on all shared and re-seller accounts; it has a slight upcharge for the VPS accounts. They chose LiteSpeed because can be up to nine times faster than Apache, and three times faster than SSL Apache. It also claims to process PHP 50 percent faster. MDDHosting makes it incredibly easy to get up and going. You get instant provisioning for VPS hosting and you get free transfers on shared hosting. The amazingly fast customer service translates over to site migrations, as well. Some users found that within a few minutes of sending over their hosting login information to MDDHosting, the company already had their site up and running on the MDDHosting servers. Along with most other hosting companies, MDDHosting offers a 30-day money-back guarantee if you aren’t happy. You’ll get a full refund for services paid to the company, minus the $14.95 for domain name registration. In addition to domain registrations, dedicated servers, design, lifetime plans and colocation don’t come with a money-back guarantee. Softaculous, a one-click script installer, is included on shared and reseller plans (again, it’s available for a fee on VPS plans). Because of the integration, you can easily install a variety of different apps, including WordPress, Joomla, Drupal, Magento, and other e-commerce apps. From LiteSpeed, which I mentioned before, to the SSD predictability and consistency in the servers, you can rest assured knowing that MDDHosting has a solid plan to protect and support your Web site. Their Xeon Quad core processors with 8 cores are in the Handy Networks data center in Denver, which includes a highly controlled environment with intensive connectivity and security. Where many other hosting companies require you to pay extra for regular backups, MDDHosting gives you automatic daily backups on all of their plans and at all hosting levels. This gives you peace of mind, knowing should there be any problem, your Web site can quickly and easily be returned to a stable status. When you look at some of the big-box hosts, especially those owned by large conglomerates, you’ll see that they offer quite a bit of “unlimited” for extremely low prices. The difference between these companies and MDDHosting is that the unlimited offered by MDDHosting is far more generous and able to support your Web sites, includes many more features, and really, only costs slightly more than some of the bigger companies. MDDHosting offers a wide variety of additional features, from free site transfers to daily backups. The use of cPanel means that should you ever want to migrate your site to another host, you have a better chance of receiving that host’s transfer and migration services for free, if that’s something they offer. MDDHosting offers some of the fastest page load speeds out there, giving your Web site visitors a better experience. While they promise 99.9 percent uptime, MDDHosting doesn’t always deliver. However, they guarantee their uptime and back it up with a one month credit when your site experiences greater downtime than promised. MDDHosting’s prices are greater than other hosts, but they provide more services and support for that pricing structure, as well. MDD got into the act much later compared to most of the hosting service providers in this list. MDD began its journey in 2007. It made my top 10 list of Website Hosting Service Providers because it is insanely fast. And I say this after comparing it with the famous companies in the business. Many would argue that it is a small size company but what matters most is that this company sticks to what it does best. That is providing hosting services for your websites. As a result, it provides great customer care solutions within less than three minutes of queue time. Also, you’ll hardly have outage issues. With that said, the uptime of 99.88% is a bit on the medium side. But since it manages to cache your website, secure it and has HVAC system to cool down the servers, downtime is lessened to a considerable proportion. MDD has a Denver-based server with multiple substations that power your websites. It is cheap and also, reliable when it comes to solving problems and maintaining a quality service. Even during scheduled maintenance, you’ll not suffer from performance issues, and that is a guarantee.